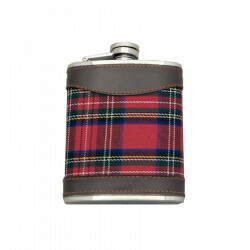 Stainless steel flask, red tartan pasted fabric, synthetic leather. Stainless steel flask, red tartan pasted fabric, synthetic leather. The perfect gift, easy to travel with! The story goes that, during the 18th century, women boarding English warships, berthed along the quay, used to sneak gin contained in makeshift flasks, usually made in pork's bladder, hidden in their skirts.